To compare transactional email service of various providers or even understand what is transactional email, it’s best to begin by understanding email itself. There are an estimated 4.92 billion email accounts today. These accounts send and receive some 225 billion emails every day. That’s about 45 emails per account per day. If personal emails with funny cat videos and vacation pics is all you send, you don’t need to bother. But if you are a marketer, a business or even a not-for-profit that sends out lots of business emails, understanding how email works will surely help you get more out of your transactional email service provider once you’ve understood how to improve email deliverability. Between the time when you hit “Send” on your Gmail – or something similar – and when the recipient clicks your email to read it, a number of events have happened in quick succession. Let’s take a quick look at how email works; it will soon make sense when you want transactional email service compared. The process begins when you hit “Send” on your email. Your email and attachments, if any, are uploaded to the SMTP (Simple Mail Transfer Protocol) server. Probably, there would be many other emails waiting their turn. Your email is added to the queue and will have to wait its turn. Once it’s your turn, your SMTP server starts hunting for the recipient’s server. This is done with the help of the DNS (Domain Name Server) which works like your typical phone book. If your SMTP server cannot locate the recipient server, it will return you the email. These returned emails, called ‘Bounced Email’, will carry an appropriate “Mail Delivery Failed” message. If, your SMTP server locates the recipient email server, it hands over the email and its attachment. The recipient server will ‘screen’ your email for a number of things. That includes the size of attachment, virus threats, sender reputation, contents of the email, its subject-line and other routine stuff. It then places the email in the inbox or the junk folder (aka Spam folder), based on the results of screening. When the recipient checks her email account, she’d see your email. If, however, your email lands in the junk folder, the recipient will likely never have a look at it. Messages in spam folders are generally deleted automatically after a certain number of days, unless the recipient marks the email as Not Spam and transfers it to some other folder. What more does your outgoing email server check? For many reasons, the above explanation has been over-simplified. For instance, your own outgoing server too may perform a few checks before hunting for the recipient. These checks include looking for simple stuff like whether the recipient address has incorrect syntax (e.g. somename@some domain(at)com, is incorrect because of the extra space between ‘some’ and ‘domain’). Further, your own server will try to see if you’re sending out something that sounds like Spam. If something doesn’t look right, your email server may refuse to process your email further and return it to you with an appropriate message. And here’s something of our interest, just before we compare transactional email service of major service providers. Your SMTP server is designed to handle only so many emails on a daily basis. A free Gmail account permits no more than 500 emails a day. For someone sending out personal emails, this limit is quite generous. Business or marketing requirements, however, are often a great deal bigger. Quora has an estimated 120 million users – you can imagine the number of emails Quora sends out daily and the kind of transactional email service it uses! Or consider this: 5 Facebook profiles are created every second. That’s well over 400,000 per day! Sending verification links over emails is a juggernaut of a task. Gmail’s regular daily limit of 500 emails would be ridiculously low for such huge requirements. But that’s fine, because Facebook, Quora or even your bank don’t resort to the basic email. Businesses and organizations and governments, every day, send out hundreds of thousands of emails. These emails called Bulk emails, because of their huge quantities. They use bulk email sending service, of which transactional email service is a category. The mechanism of sending bulk emails differs significantly from that of personal emails, like the Gmail. There are two types of bulk emails: marketing emails and transactional emails. Marketing emails are a part of the larger marketing strategy. Marketers and companies send out hundreds of thousands of emails daily. These emails may carry a variety of messages: marketing offers, contests, special coupons, sale begins – or ends – notifications, … there seems to be no end. Transactional emails, on the other hand, are a response to transactions. They communicate (and often confirm) whatever transactions the customer has carried out. For instance, you may have upgraded the credit limit of your second credit card. Your credit card company, or the issuing bank, will immediately send you an email with its details, using transactional email service. 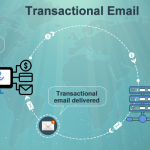 The word ”Transaction” might have led you to believe transactional emails will happen primarily around financial transactions when you spent or earned money. That’s only part of the story. As you will see in the following paragraph, there could be countless transactions that don’t involve money and yet prompt the server to send you an email. And that’s the whole reason to get into transactional email service provider comparison: there’s so much that at stake! Transactional emails differ from marketing emails on various counts. None of these actually involve spending or receiving money, right? And yet, the services they need come under the transactional email service. Secondly, transactional emails don’t go out in bulk in the same sense of word as marketing emails. For instance, twenty nine friends comment on the video you posted on a social media site. But each of them would have commented at different times. That means you’ll receive each of these transactional emails at different times. Thirdly, while a transactional email service may carry emails with a bit of marketing content (like adding “Often bought together” at the bottom of the receipt of that wifi router you purchased), sending of these emails cannot be timed strategically by the sender. Transactional email service send emails only when there’s a transaction, not when the marketer finds it convenient to email you. Finally, different sets of laws and policies regulate transactional emails and marketing emails. For instance, Canadian laws do not allow you to add any marketing content at the bottom of your transactional emails. Other countries are a little more liberal about this. Do you need a specialized transactional email service for sending transactional emails? Before we answer this question, let’s look at your current email infrastructure and your requirements. It’s quite likely you have your app, customized to send out emails the way you want. You have probably self-hosted it and believe it gives you a lot of control. That’s great. But with your own app you might soon hit the ceiling. As discussed earlier, the quantum of transactional emails is a great deal unpredictable. That means your email system should be versatile enough to handle the large variance in the number of emails you send. Let’s examine this further: you schedule to send two marketing emails to the 300,000 of your subscribers. You schedule the first for 3 PM Monday and the second for Friday 10 AM. That’s it – nothing more. The rest of the time, your system is not in active use. With transactional emails, it’s different. You will not be sending out 300,000 emails all at once. You will be sending them out as transactions happen, as explained earlier, sometimes even one at a time. That means your transactional email system can remain busy round the clock. There are many transactional email service providers. Most offer free transactional email service that you can test-drive before you commit. We studied a number of them so that you could get a comprehensive comparison of best transactional email service providers that are market leaders. Flexibility, agility and high performance describe CampaignMonitor’s transactional email service. If you’re already a CampaignMonitor customer using their services to send marketing emails, you can use the same credentials to send out transactional emails. There’s no need for fresh credits or a new account. To begin with, you can use the email builder to design better emails that stand a better chance for engagement. Alternatively, you may upload your own templates. The wide range of analytics you get to act upon begins from “% opened”, “% clicked” and extends to detailed reporting. CampaignMonitor is committed to reliability, email deliverability and great support. This ensures higher results for your emails. Additionally, you can use their advanced testing tools to improve your transactional emails. Based on what these tools reveal, you can choose to improve your emails and achieve better engagement and favorable action from recipients. Perhaps what stands out is their transparent reporting of issues: they update known issues. This includes current and past issues known and whether all systems are operational. Is A/B Testing available? Yes, for upto 3 variables. For (a) Subject lines (b) From name, and (c) Email content. Get details of emails delivered, clicks, average opens and bounce rates for all transactional emails sent out for upto the past 12 months. Send transactional emails to your Salesforce contacts. Manage it directly from your Salesforce account. SendGrid is another, highly trusted transactional email service. It offers solutions that are highly flexible, fully capable of customization and easy to use. It delivers over 14 billion emails every month using its robust infrastructure. Large companies like Airbnb, Uber and Spotify have been using SendGrid services. One of the really outstanding features of SendGrid is its Event Webhook arrangement. This arrangement offers feedback, in real-time, for every single email you send out. That provides you a window into what’s happening to your transactional emails. It has a drag-and-drop email template editor and offers online list management. Further, it helps deal with replies to your emails, treating replies the way you want to. The comprehensive, real-time analytics report help you go beyond primary details. It helps you figure out, in detail, what is working and what is not. You also get reports on bounce, click, open etc. can take desired action quickly. In the unlikely event that you are stuck, there’s an ever-increasing library of online documentation, videos and posts. You can use these to make the most out of the service. Which API Library are maintained? Ruby, Python, Java, PHP etc. Your emails will be secured with a two-factor authentication. Mandrill’s focus on providing transactional email service makes it a specialist. First of all, Mandrill has been built on the same infrastructure as MailChimp’s. That alone guarantees high quality performance. The detailing available is really good. For instance, you can send out different templates to different proportion of recipients for every message. The results tell you which templates received more clicks so you can alter the remaining messages accordingly. Mandrill directly addresses issues like latency by maintaining globally distributed infrastructure. This increases the speed of delivering your transactional emails. And you’ll agree that is of critical importance in transactional emails. Mandrill’s registered IPs work in tandem with the feedback system of ISPs. This way, you can easily track spam complaints, using your Mandrill account. To make analytics easier and more actionable, Mandrill has a system that automatically tags your emails. That is based on senders and templates used. As a result, you can easily track the emails sent out, study the impact and put the learning into immediate use in the next campaign. No wonder they have had a API Uptime of 99.98% and SMTP uptime of 99.91%. Is A/B Testing available? Yes, for upto 4 variables. For (a) Subject lines (b) From name, (c) Send time, and (d) Email content. API Library covers: PHP, Ruby, Python, Curl, etc. SparkPost is respected as being technologically strong and yet very simple to use by its users. Sending customized transactional emails is easy since SparkPost carries HTML templates that support variables. For unique messages, you may use the conditional rules that substitute data as per requirements, keeping other contents unchanged. The email design and inbox preview tool help you design high-impact emails, incorporating all the personalization you want. Secondly, SparkPost transactional email service has great analytics support. Their analytics calibrates performance of your emails against over 40 unique metrics. SparkPost comes with detailed, real-time data integration. That means you have more data to understand the impact of your emails and take informed decisions earlier. Finally, the emails you send out are more secure, since each API key can be limited to a predefined IP address. Each API key can be restricted to specific IP addresses and have its own permissions for a secure email sending setup. They maintain a superior infrastructure and use very high ISP domain coverage for great delivery. With transactional email service, a delay in delivery time of more than a couple of seconds can make them restless. PostMark targets an average delivery time of 0-10 seconds for transactional emails, and, in their words, “…beyond 10 seconds, we dig in”. They transparently share their average delivery times on their status page. PostMark, trusted by companies like Asana and Proposify, understands that Time To Inbox (TTI) is key in the transactional emails system. A unique advantage they enjoy is that they work only with transactional emails. As a result, they report getting a higher engagement than service providers who focus on sending marketing emails. Consequently, they have come to enjoy better reputation with ISPs like Gmail. PostMark helps small and mid-sized senders safely share a closely monitored set of IPs. As the sending needs grow, senders can switch to a dedicated IP. You can access the feed of the past 45 days of every email sent to every address. From this, you can study everything from larger aspects to granular-level details. To ensure your emails are never lost, PostMark maintains data centers across the world. Exclusively focused on transactional email, PostMark screens every signup. It approves only those sending genuine transactional emails. This high degree of precaution helps them maintain a very high reputation with ISPs. They try and keep their Time To Inbox (TTI) the best in the industry. They openly compare themselves with major competitors and put the results on their website. Another major transactional email service sender, MailJet offers a wide range of features and options. Competitive pricing, great support and a commitment to inbox the emails makes MailJet special. MailJet works hard to help customers achieve deep personalization and dynamic layout and thereby positively impact open rates. Their system assists customers structure emails that best reflects respective business approaches. Brands like Sketchfab and MentionMe trust MailJet for many reasons. For instance, MailJet does a lot work in making sure the key indicators of deliverability always point in the right direction. Because their analytics keep a close watch on the entire chain, customers are notified real-time when an issue arises. That helps customers address and resolve the issue almost as soon as it comes up. They also score high on reporting customers on the go. Customers can choose to receive notifications by email and Slack; plans for SMS and webhook notifications are on the anvil. For better insights, customers can categorize messages and their thresholds so the impact of each of category can be separately studied. API library covers: Ruby, Python, Java etc. Allows customization to hide or display selected partitions of mails, based on conditions you can set. Templating solutions are comprehensive, with the MJML open-source markup language. That removes lots of trouble from having to write lot things yourself. The SES enjoys two advantages: it is simple and it is affordable. That means it is useful for businesses and organizations of all sizes. You can also integrate AWS with your email client for further customization. SES is trusted by organizations like HBO, SuperCell, Vodafone Italy and Siemens. Its massive, globally spread set of data-centers presents a strong case for high security, reliability and redundancy. Further, it’s so fully scalable you are free from any worries, irrespective of your size and speed of growth. Existing customers appreciate its ease of implementation and management. SES offers huge capacity and yet there’s no compromise with its flexibility, speed or simplicity. When used with Amazon Relational Database Service, it helps businesses do away with administrations chores that otherwise may use up a lot organizational time. All this helps businesses offer and deliver their services a lot faster to their customers. This results in a better experience and higher customer satisfaction and retention. Are dedicated IPs available? Default is shared IP. Dedicated IP available upon request. Amazon SES allows you create email templates that contain replacement tags for personalization of content. It’s difficult to beat Amazon on the pricing front: $0.10 per 1,000 emails sent thereafter. If your application is hosted on Elastic Compute Cloud (EC2), you can send the first 62,000 emails for $0! It’d probably be incorrect to say there’s one size fits all requirements. Some transactional email service providers may score on pricing while others may have better analytics. Yet some other service provider may have the best of templates. You’re better off by clearly identifying what exactly you’d want out of the the transactional email service provider. Next you’d need to see the size of transactional email you are likely to send out. Now ask yourself the kind of metrics you’ll want to measure. Finally, try and estimate what is the kind of support you’ll need: from ready made templates to customer support in setting up things. Now you’re on the right stage where you can compare transactional email service providers. Are you aware one of the simplest ways of improving email deliverability is email list cleaning? Do you think we missed out something in our comparison of transactional email services? Feel free to share your thoughts, in the comments section below!